The Flicksville Room is designed to demonstrate life in an early village. Flicksville is located just south of Bangor in Washington Township. Upon entering the room you will first see a 3D map of the 16 original businesses and important locations needed to sustain early life in an early village. The room contains a gristmill display complete with a handmade, working model of a gristmill. The Griffin Brothers Slate Factory is highlighted with worker photos and student slates. Famed airbrush artist Sharon Ryan created a beautiful wall hanging depicting Flicksville’s historical progression. 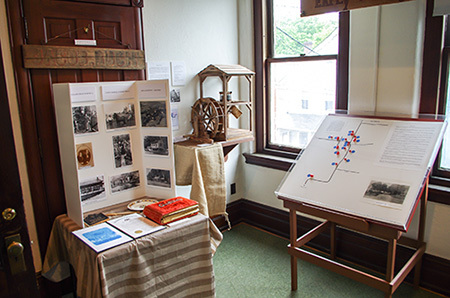 The Flicksville church and one room schoolhouse are showcased with photos and descriptions. One of the most popular displays is the tribute to the Knights of the Golden Eagle. 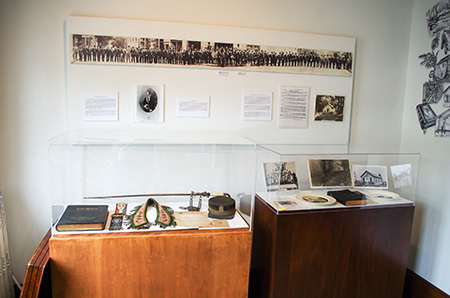 This showcase contains original uniform, sword and letters of the organization that helped many people in need. This room is dedicated to Mr. & Mrs. Sherwood (Shirk) Jones, who created the original Flicksville Room.